Over the past two decades, frequent, large, destructive wildfires have claimed hundreds of thousands of acres of land, damaged or destroyed hundreds of homes and structures, caused deaths and injuries and displaced residents for extended periods of time. With continued development throughout the state’s Wildland Urban Interface (WUI) areas, estimated to grow by 300 percent in the next 15 years, the wildfire threat is real and it is not going away. Project Wildfire is designed to reduce and/or prevent the destruction of land, property and lives by raising awareness and educating residents throughout our state. In the face of long-term risk, Colorado REALTORS® believe that education combined with monetary incentives, along with access to local resources, are the most effective ways to address future wildfire damage and avoid unproven, unreliable legal mandates and policies which may be proposed to address the issues. Colorado REALTORS® are working in partnership with other like-minded fire prevention organizations across our state to bring education and awareness, as well as access to resources directly to residents in their local communities. Without proactive steps by homeowners, there is a strong potential for an increase in property related expenses including higher transactional costs and taxes, as well as rising insurance premiums for both residents in WUI areas and throughout the state. Colorado REALTORS® support the idea of creating incentives (tax deductions or credits, lower interest rates) for residents who provide evidence of voluntary wildfire safety compliance. Colorado REALTORS® continue to focus their efforts on the protection of homeownership and individual property rights with an emphasis on safety and prevention of wildfires. West Region Wildfire Council: Dedicated to providing public outreach, education as well as technical and financial resources to rural residents related to understanding and mitigating wildfire risk to: Delta County, Gunnison County, Hinsdale County, Montrose County, Ouray County, San Miguel County). Homeowners can take steps to protect their property and help alleviate the spread of wildland fires. Many Coloradans living in the foothills in ponderosa and lodgepole forests need to consider the fire-prone nature of these ecosystems. Defensible space is the area around a home or other structure that has been modified to reduce fire hazard. In this area, natural and manmade fuels are treated, cleared or reduced to slow the spread of wildfire. 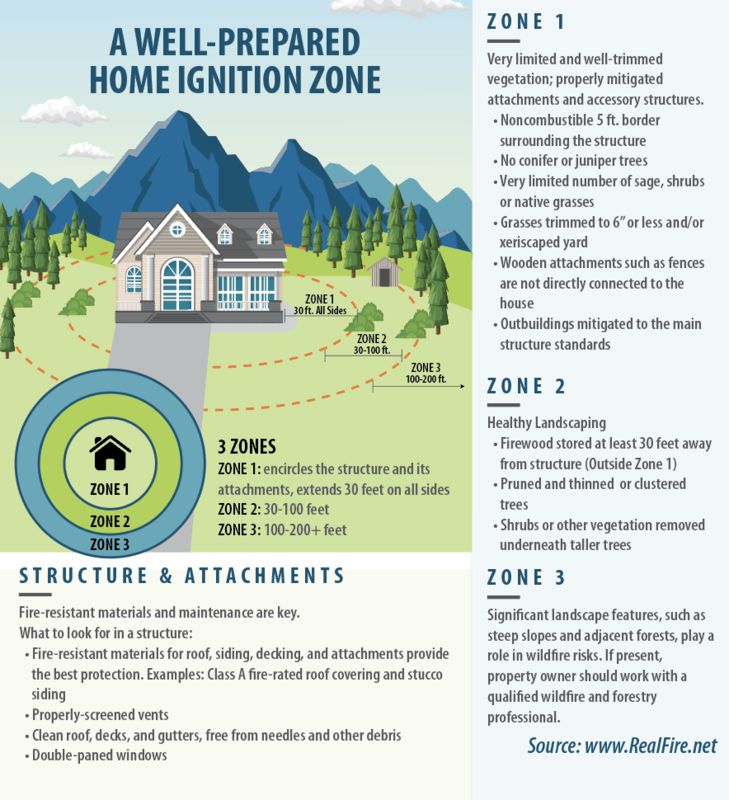 Creating defensible space also works in the reverse, and reduces the chance of a structure fire spreading to neighboring homes or the surrounding forest. Defensible space gives your home a fighting chance against an approaching wildfire. Creating an effective defensible space involves a series of management zones in which different treatment techniques are used. Due to Colorado’s arid climate and fire-dependent forests, many homeowners and landowners may be particularly vulnerable to wildfires. It is important to keep this threat in mind when buying or building a home. Fire is unpredictable. If there are weaknesses in your home’s fire protection scheme, fire can gain the upper hand because of some overlooked or seemingly inconsequential factor. By creating wildfire-defensible zones, homes are less vulnerable from this naturally occurring phenomenon and the chance of spreading wildfires is greatly reduced. Learn more from the links below or visit the Colorado State University by clicking here. 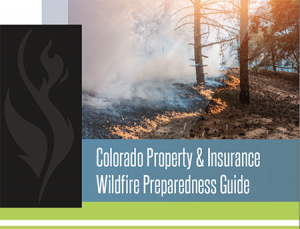 While there are many tools available to help educate people about Wildfire prevention and the ways to reduce your risk, Colorado REALTORS® strongly believe in tapping into the numerous local programs and fire prevention resources available in communities throughout the state as the most up-to-date, geographically-focused information available to Colorado residents. Through our Project Wildfire Program, Colorado REALTORS® are working in partnership with other like-minded fire prevention organizations across our state to bring education and awareness, as well as access to resources directly to residents in their local communities. Wildfire Partners: When Lester Karplus moved to the mountains near Nederland, Colorado he knew it was a matter of “when not if” his log home would be in the path of a wildfire. That day arrived in July 2016 when the Cold Springs Fire forced 1,900 residents to flee “100-foot” flames on a moment’s notice. While eight neighboring homes burned, Karplus’ home and seven others in the path of the fire survived — all participating in Wildfire Partners, Boulder County’s community wildfire mitigation program that provides homeowners with a comprehensive on-site property risk assessment that includes step-by-step mitigation needs, resources, a consumer-help line and follow-up inspections. The result – a coveted “Wildfire Partners Certified” yard sign and reduced wildfire risk. Many insurance companies accept Wildfire Partners assessment to meet their mitigation requirements. Karplus says homeowners buying in wildfire-prone areas need to ask themselves: “Are we willing to be caretakers of the land?” If the answer is yes, they must understand the inevitable risk of living with wildfire and the long-term commitment needed to protect their property. For more information: wildfirepartners.org. County, the Vail Board of REALTORS®, and other local partners. • Residents engage directly with local mitigation professionals to learn about local wildfire risk. • Residents can earn a REALFire® certificate of recognition, which they can use to enhance real estate transactions or share with local insurance providers. • Qualifying residents may be eligible for an income tax subtraction for mitigation work performed on their property. • Assessments identify specific actions proven to reduce wildfire risk on a property. (May 25, 2016) Colorado Association of REALTORS® and West Region Wildfire Council Bring REALTOR® and Homeowner Wildfire Awareness and Education Program to West/Southwest Colorado. Read the press release. See the Montrose Daily Article. See the Ouray Article. Request Brochures to be mailed to you. View this interactive map to get an idea of your risk.